Urban/Environment from Ben Hovland on Vimeo. Urban/Environment explored urban ecology along Chicago Avenue, focusing on natural beauty in unexpected places, the fragility of life, and the tension between man-made structures and living organisms. Thirty-seven signs combining photographs and descriptive text were installed in public spaces for the summer of 2013. These signs mimicked the mannerisms of state park signage. Images focused on a micro view, encouraging a closer look at our surroundings. The signs were installed along Chicago Avenue and immediate side streets – in front yards, businesses’ windows, community gardens, and public areas. 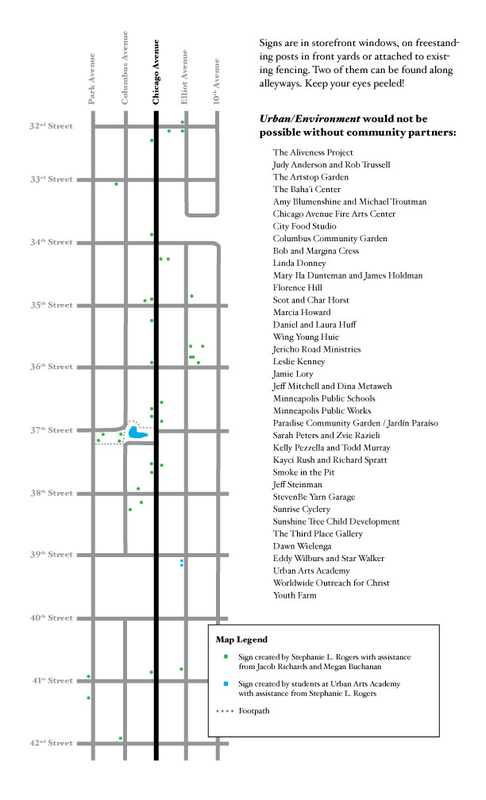 Installation locations were chosen for their proximity to the places where the photographs were taken. The text was developed in collaboration with Megan Buchanan and Jacob Richards, two biogeographers who live in the neighborhood. Richards and Buchanana ensured that the signs are as informative as they are lovely. Guided walks occurred in May, June, and July of 2013, as the public was invited to join in a hike along Chicago Avenue to learn more about our urban ecosystem. This project is part of Arts on Chicago. The Arts on Chicago initiative is an arts-based community development project in Minneapolis, MN, led by Pillsbury House + Theatre, Upstream Arts, the Powderhorn Park Neighborhood Association, and MCAD Professor Natasha Pestich with support from the Ward 8 Council Office of Elizabeth Glidden. Arts on Chicago is funded in part by Artplace, a collaboration of twelve of the nation’s leading foundations, eight government agencies including the National Endowment for the Arts, and six financial institutions across the U.S.
Stephanie L. Rogers is a fiscal year 2013 recipient of an Artist Initiative grant from the Minnesota State Arts Board. This activity is made possible by the voters of Minnesota through a grant from the Minnesota State Arts Board, thanks to a legislative appropriation from the Arts and Cultural Heritage Fund.